From time to time you may need to have access to a crane because you have a load that is too small to spend the extra money to rent a crane. Nevertheless, you can not lift it up by hand or by any other way, but as an alternative a forklift can suspend a load with a hoist hook forklift attachment and lift it to a more elevated position by raising the forks to the appropriate height and moving it to the desired location.. 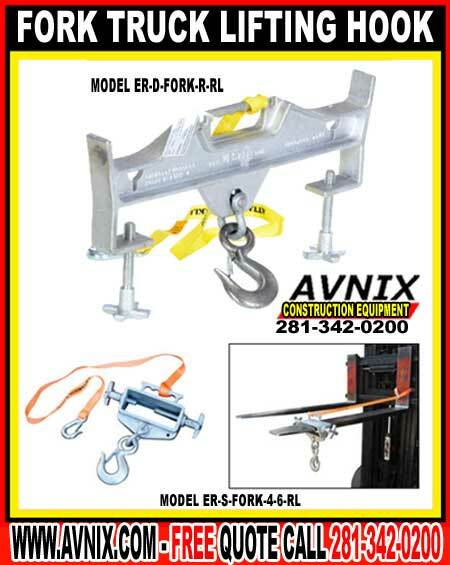 If you come across such an need, use an Avnix lift & hoist hook to get the job done quickly and safely. Our hoist hook attachment is the safest way of lifting suspended products by means of a forklift. 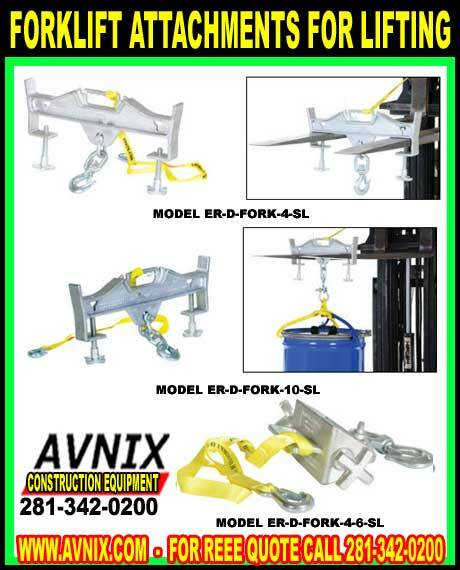 Lifting hooks can be used with either an extendable reach telehandler or straight mast forklift. Never try to chain the object to the forks. A lifting hook is an forklift attachment with two fork pockets that slide onto the forks. Between this attachment there is a swivel hook positioned at 24”. 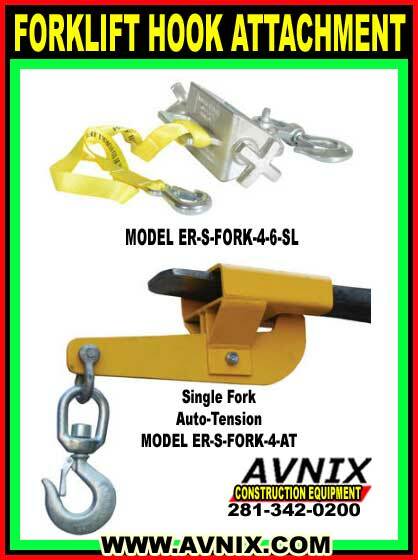 The hoist hook attachment is secured to the forks by a heavy duty chain. This keeps the lift hook from sliding past the 24 inch mark, which is vital to safe operations. The basis for this is lies in the way the forklift is built. The load center of a typical fork truck is 24 inches. Anything positioned forward or aft of this built-in center of gravity throws the entire forklift a little off balance. This may be something you can get away with if you are lifting an very light load. Conversely, if you are lifting something of significant mass, you run the risk of losing your material on the ground, or even worse, overturning the vehicle or injuring a employee. The lift hook is intended to give you a safe, ergonomic, and time-saving answer to this likely problem. Because it is positioned at exactly 24 inches to the rear of the lifting hook frame, it places any load you attach to it exactly at the standard manufacturer load center rating position—which on most forklifts is 24 inches. This allows you to use your typical forklift as you usually would, although you must deduct 265 pounds, which is the weight of the hoist hook itself, from the total rating. For example, if your fork truck is rated at 8,000 pounds in a specific boom configuration, you must subtract 265 pounds from 8,000 pounds to arrive at a total of 7,735 pounds—your new rating when using this forklift attachment. It is very key to never go beyond this factored rating, even for purposes of testing. Also, check your forklift manual for variations of the load capability based on difference in boom position. Normally, when you elevate the forks, the rated lift capability will be reduced. Likewise, on extendable reach forklifts, the rated capacity decreases when the boom is extended. You must only use the lift hook with the forklift forks level or with the tips tilted only slightly upward. The hoist hook is intended for vertical lifting only, so you should never use it to pull any type of load. Clear the work area around the load of all workers previous to lifting, and inform all staff onsite to stay at a safe distance.